Late last Sunday afternoon, over forty Mackay Road Runners enjoyed the challenge of the Harbour North Wall Three Peaks challenge, with distance options from 5km to 9.5km in perfectly breezy humid conditions. Club Captain, Jim Ford tested his charges in one of the final social off season training sessions prior to the first formal run on the 2018 Mackay Road Runners calendar. Jim, who’s running experience is boundless, is an awesome coach and organiser of the off season events as well as a major contributor throughout the official Club season. Alana Ford, who has also been an integral part of the Club being it’s 2017 Secretary, has also been an excellent motivator and energetic assistant to Jim throughout the Sunday afternoon events as well as the weekly social 6pm Wednesday runs from the Bluewater Quay. Alana has just stepped down from the Secretaryship to focus on a new role within the Club, which will assist new and inexperienced runners, thus offering additional inclusive benefits to the Club’s events. Jim & Alana, who are excellent athletes themselves, will be seen out and about supporting their favourite club as they have been since arriving in Mackay over ten years ago. Other family members, Peter, Alex and Anthea have also been enormous supporters of the Mackay Road Runners Club. The Harbour North Wall Three Peaks Challenge was a testing affair with ascents of hills at the Seabreeze Hotel, Lamberts Beach Lookout and Albatross Street, Slade Point. 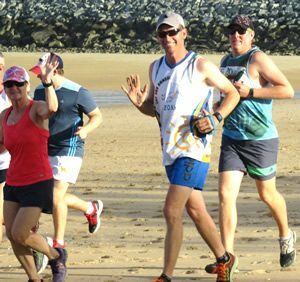 Runners utilised varying terrains including the North Wall beach foreshore, sand dunes, Lamberts Beach/Slade Point Reserve trails and bitumen roads. Many thanks for weekly assistance to Jim & Alana via Andrew Short, who quickly jumps into action when required….much appreciated. Runners were also treated to a grand finale to the event with a sensational refreshing dip in the ocean post run and prior to the usual recovery of fruit and lollies. This also caused Jim a slight conundrum where he was unable to announce the team winners due to the runners preferring to frolic in the ocean… although all agreed…..no prize required….everyone’s a winner! With the final run of the off season Summer Series this Sunday at 5.30pm from the Grove Tavern, Andergrove, runners and their families are invited to stay post run for the usual refreshments and/or refreshments for purchase inside the Tavern to celebrate the very successful social series. Runners can also look forward to random draw prizes as well as the usual congenial heckling and comradery within their ranks…..all welcome! Mackay Road Runners held their Annual General Meeting last week where the official 2018 program was passed for approval as well as Committee positions vacated and filled. However, the Club is still looking for volunteers to fill or assist some very important roles so that they can continue to be one of the most successful and popular Clubs in the region. 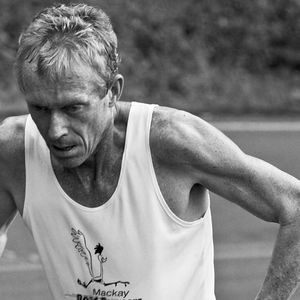 The 2018 program has now been updated on the Mackay Road Runners website – take the time to visit mackayroadrunners.com.au so you can plan your 2018 running year. The Club will also be calling for members, their family or friends to volunteer at least once throughout the year, mainly to assist current race day volunteers ie timekeepers, waterstop attendants, marshals, etc. With a current membership base of over 150, if members can give a small amount of their time, it would be much appreciated. Hence the load will be alleviated on the members who volunteer each and every week, thus allowing everyone to gain an insight into what is involved in staging a weekly event. Everyone loves to run, therefore, all voluntary assistance would be a valuable asset to all Club members. Mackay Road Runners and the local community are reminded of the Mackay Regional Council’s Sports Expo and Sign on day on the 11th February from 9am to 1pm at the MECC. Mackay Road Runners will, as usual, be in attendance to answer any queries for new and existing Members. The Club will also conduct its first official calendar event in the afternoon on the same day, commencing 5.30pm at the Mackay Harbour Boat ramp carpark precincts…..all welcome!